本发明提供了一种在无线多跳通信网络中用于地址解析映射的方法，其中，该网络由客户端装置和/或基础设施装置组建，网络业务是基于使用ARP转发和转播定位在此类网络体系结构中的装置。 The present invention provides a method in a wireless multihop communication network for the address resolution mapping, wherein the network established by the client device and / or infrastructure, network traffic is forwarded based on the use ARP broadcast and positioned in such It means a network architecture. 本发明还包括用于此类网络的装置，并且描述了完整的通信系统。 The present invention further comprises a means for such networks, and a complete description of a communication system. 本发明涉及通信网络，特别是在自组织网络中的计算机网络，并且具体地说，涉及使用附加的地址解析协议（ARP)消息类型的基于分组的路由选择方案。  The present invention relates to communication networks, in particular computer network in an ad hoc network, and in particular to the use of an additional Address Resolution Protocol (ARP) based on the type of message packet routing scheme. 移动用户之间的无线通信正随着装置和技术的发展而变得越来越普遍。  The wireless communication between the mobile user is with the development of devices and techniques are becoming increasingly common. 基础设施延伸范围在电信系统和数据网络系统内不断扩展。 Extension of infrastructure in telecommunication systems and data network systems continue to expand. 今天，电信系统也在不断增加使用分组交换网络，并且趋势是明显向着此基于分组的路由选择的方案发展。 Today, telecommunications systems has also increased the use of packet-switched networks, and the trend is clearly toward this program based on the development of routing packets. 在数据网络中已使用此系统许多年，因此，存在许多用于此目的的标准化路由选择协议。 This system has been used for many years in a data network, thus many standardized routing protocols exist for this purpose. 然而，对于例如像所谓的自组织网络等快速变化的网络拓扑图，它们并未作好准备。 However, for example, the rapidly changing network topology like the so-called self-organizing networks, they are not ready. 无线自组织网络的特征在于它们不具有像普通有线网络基础设施一样的静态性质，基于自组织的网络没有集中控制，因此经常以自发的方式创建。  The wireless ad hoc networks is that they do not have as an ordinary wired network infrastructure as static properties, based on self-organizing network without centralized control, and thus are often created in a spontaneous manner. 它通过分散式概念维护控制。 It maintains control through a decentralized concept. 与标准固定网络体系结构相比，节点可以以不受控的方式连接或断开；节点可快速加入和离开，这形成了动态变化的网络拓扑。 Compared to standard fixed network architectures, nodes can be connected to or disconnected in an uncontrolled manner; nodes join and leave quickly, which forms a dynamic network topology. 一些情况下，此类自组织网络由作为基础设施组件的用户/客户端装置本身形成。 In some cases, such an ad hoc network formed by a user / client devices themselves as infrastructure components. 用户四处移动，进入和离开网络小区，从这方面而言，这些组件因而确实是移动的，因此，基础设施将四处移动并相应地动态变化。 Users move around, enter and leave the cell network, in terms of this aspect, these components are mobile and therefore do, therefore, the infrastructure will move around and change dynamically accordingly. 这是一种令人激动并有前途的构建基础设施的方式；然而，它对路由选择协议提出了极高的要求。 This is one kind of very excited and have a promising way to build infrastructure; however, it made a high routing protocol requirements. 无线环境中的其它问题是由于将使网络流的性能和效率降级的无线电特定问题。  Other problems in a wireless environment due to radio specific questions will performance and efficiency of the network flow degradation. 可能存在由于基础设施节点的移动或无线电环境中对象的移动而引起的衰落问题，并且可能存在由于来自范围内其它无线电源的干扰而引起的问题。 Fading problems due to the presence or movement of the mobile radio environment the infrastructure node may be caused by an object, and there may be problems due to interference from other radio sources within range caused. 这些种类的网络拓扑图已在军事环境中使用，但现在还正转移到民用领域。  These kinds of network topology has been used in the military environment, but now being transferred to civilian areas. 无线系统现在用于为例如住宅区或商业区中的无线宽带接入快速构建基础设施区域。 Wireless systems are now used, for example, wireless broadband access in residential areas or commercial rapidly build infrastructure areas. 它可用于暂时的基础设施组建，例如，在紧急情况下、在灾难地区中或在战场上用于军事用途。 It can be used for temporary infrastructure build up, for example, in emergency situations, in disaster areas or for military use on the battlefield. 它还可用于在像例如音乐会、会议、集会或季节性旅游区等事件期间组建临时接入覆盖区。 It is also used in events like for example during concerts, conferences, meetings, or seasonal tourist areas set up temporary access coverage areas. 在这些种类的区域中，不必全年覆盖而只需要在特定时期期间覆盖，因此，在此类情况下固定基础设施组建会显得太昂贵。 In these types of regions, you do not have to cover the whole year but only during a specific period of time covered, therefore, in such cases the fixed infrastructure set up to be too expensive. 今天，几个因特网服务提供商（ISP)在诸如机场、餐厅、咖啡馆和酒店等公共或半公共区域，使用固定无线基础设施系统提供无线接入。  Today, several Internet Service Providers (ISP) in public or semi-public areas such as airports, restaurants, cafes and hotels, using fixed wireless infrastructure systems provide wireless access. 这些系统经常称为所谓的热点。 These systems are often referred to as the so-called hot spots. 随着用户获得接入的需求增长，在考虑覆盖和带宽的情况下，一种扩展无线覆盖或带宽范围的方式是安装更多的基础设施组件，然而，通过普通的固定无线组件进行此扩展是昂贵的，因此，出现了使用无线路由器构建网络的想法。  As users get access to increased demand, in consideration of coverage and bandwidth, an extended range of wireless coverage or bandwidth is to install more infrastructure components, however, carried out by conventional fixed wireless components this extension is expensive, and therefore, there was the idea of ​​building a network using a wireless router. 这种情况下，自组织路由选择协议可用于实现简化的安装过程。 In this case, the ad-hoc routing protocols may be used to achieve a simplified installation process. 在论述自组织网络时，基本上有两种网络使用；第一种使用是组建局域网而无任何提供到例如因特网等外部网络的接入的外部网关。  In the discussion of the ad-hoc network, using substantially two network; first use is to set up a local area network without any external gateway providing access to an external network such as the Internet. 此方案可在涉及灾难地区的安装或战场上的军事安装中找到。 This program can be found at a military installation involves installing on the battlefield or in disaster areas. 另一种可能更常见的使用是在一个或几个网关为网络提供到例如基于IP(因特网协议）的专用或公共网络（例如因特网）的外部连接时。 Another possible use is more common in one or several gateways provide the network to the outside, for example, IP (Internet Protocol) of the private or public networks (e.g. Internet) connection. 在此类网络配置中，视例如数据业务类型、拥塞或路由选择成本而定，数据分组可采用不同的路由和/或使用不同的网关。 In such a network configuration, for example, depending on the type of data traffic, congestion, or routing cost-related data packets may take different routes and different gateways / or use. 基于分组的路由选择方案经常围绕例如OSI参考模型等分层模型构建通信网络系统。  The packet routing scheme often build there communication network systems around a layered model, etc., for example, the OSI reference model. 通信软件或硬件划分为以分级方式工作的几个更小的子单元、层。 Communication software or hardware is divided into several smaller sub units, layers work in a hierarchical manner. 信息和通信控制参数在本地上下传递，并在发送端与接收端之间的相同层之间传递。 Information and communication control parameters passed down locally and between the same layers between the sending and receiving ends pass. 每个上述层按通信顺序负责不同的任务。 Each of said communication order layer are responsible for different tasks. 对于路由选择而言，根据OSI参考模型的前三层最为重要。 For routing purposes, the most important basis for the first three layers of the OSI reference model. 第1层负责数据比特的物理传输；物理工具的示例例如可以为基于以太网的网络中的有线链路或无线局域网（WLAN)中的无线链路。 Is responsible for the physical transmission of bits of data  Layer 1; Examples of physical means may be, for example, an Ethernet based wired network or wireless local link wireless links (WLAN) in. 第2层经常称为链路层或MAC层并负责传送数据块、检错和网络资源协调。  Layer 2 is often called the Link layer or the MAC layer and is responsible for transferring blocks of data, error detection, and network resource coordination. 第3层经常称为网络层；它负责实现网络中任何对节点之间的通信。  Layer 3 is often called the network layer; it is responsible for communication between any network nodes. 此层例如可负责路由选择计算和某一拥塞控制。 This layer is responsible for routing, for example, may be calculated and a congestion control. 为此，已开发了取决于网络类型的不同路由选择协议。 To this end, has developed a network depends on the type of routing protocols. 基于IP的网络中的分组路由选择协议一般是基于路由选择算法，这些算法使用距离向量或链路状态信息为网络中的每对源节点和目的节点查找和维护路由。  IP-based network, the packet routing protocol are generally based on routing algorithms that use distance vector or link state information to each pair of source and destination nodes in the network to find and maintain a routing. 基本上，在距离向量路由选择算法中，每个路由器向其邻路由器广播到所有主机的距离，并且接收该信息的每个路由器计算到网络中每个主机的最短路由。 Basically, the distance vector routing algorithms, each router broadcasts the distance to all its neighbor routers hosts, and each router receiving the information calculates the shortest route to each network host. 在链路状态路由选择算法中，每个路由器向其邻路由器广播其每个相邻网络链路的状态信息，并且接收该信息的每个路由器维护从链路状态信息得到的网络完整图形的数据库，并基于数据库中的链路成本计算到每个主机的最短路由。 In link-state routing algorithms, each router status information which broadcasts its neighbor routers each adjacent network links, and each router receiving the information maintains the complete pattern of the network link state information obtained from the database and, based on the link costs in the database to calculate the shortest route to each host. 这些路由选择算法设计用于相对静态的网络，并且因此新的路由选择算法必须设计用于其拓扑频繁变化的自组织网络。 These routing algorithms are designed for relatively static networks and thus new routing algorithms must be designed for frequently changing its topology self-organizing network. 基本上有两种类别的现有路由选择协议用于自组织网络。  There are basically two categories of existing routing protocols for ad hoc networks. 它们为“主动式”（表驱动）和“反应式”（按需）路由选择协议。 They protocols are the "active" (table driven) and "reactive" (on-demand) routing. 具有这些协议的组合的协议也是可能的。 Protocols having combinations of these protocols is also possible. 主动式路由选择协议不断并定期计算到自组织网络中所有主机的路由，并因此在需要发送分组到某个特殊目的主机时始终有路由可用。  Proactive routing protocols constantly and periodically calculate a route to all hosts in the ad hoc network, and thus needs to be sent to a particular destination host the packet routing is always available. 结果被保存在所有节点中的路由选择表中。 The results are stored in all the routing nodes in the selection list. 为维护到每个主机的路由，在路由器之间交换控制消息以通知网络配置和链路状态的变化。  to maintain routes to each host, control messages are exchanged between routers to notify changes of the network configuration and link status. 距离向量路由选择协议和链路状态路由选择协议均被归类为主动式协议。 Distance vector routing protocol and link state routing protocols are both categorized as proactive protocols. 应注意的是，控制消息产生了开销并可能导致网络效率降低。 It should be noted that the control messages generated overhead and may result in reduced network efficiency. 此外，在网络拓扑频繁变化时，主动式协议可能难以维护有效的路由。 In addition, frequent changes in the network topology, active agreement may be difficult to maintain an effective routing. DSDV(目的地排序的距离向量路由选择）是一种基于距离向量算法、使路由选择信息协议（RIP)适应自组织网络的主动式路由选择协议。  DSDV (Destination-Sequenced Distance Vector Routing) is a distance vector algorithm based on the Routing Information Protocol (RIP) adapted proactive routing protocol of the ad-hoc network. 每个节点维护一个路由选择表， 在该表中节点存储下一跳节点和到所有可达目的主机中每个主机的跳数。 Each node maintains a routing table stored in the table node hop node and the destination host up to all hops in each host. 在DSDV中，每个节点定期或在它检测到网络拓扑的变化时广播或多播路由选择更新。 In DSDV, each node periodically, or it detects a broadcast or multicast routing update when the network topology changes. 增量更新只更新与自上一次更新后的变化有关的信息，增量更新还用于减少控制业务。 Incremental updates about changes and updates only after the last update, incremental update is also used to reduce control traffic. 反应式协议只在有数据分组要发送时执行控制消息交换以查找/更新路由。  with a reactive protocol only performs control message exchange to find / update routing data packets to be transmitted. 源节点要发送数据分组时，它发起控制协议以通过发送路由请求消息到其邻节点来查找路由。 When a source node wants to send data packets, it initiates the control protocol request message to its neighbor nodes by sending a route to the routing. 根据此原理，反应式方案优点在于无分组要传送时不浪费网络资源。 According to this principle, the reactive scheme is advantageous in that network resources are not wasted when there are no packets to be transmitted. 然而，第一次必须形成路由时发送分组要花费更长的时间。 When a packet is sent, however, it must first form a route to take longer. AODV和DSR是典型的反应式协议。 AODV and DSR are representative reactive agreements. AODV(自组织按需距离向量路由选择）协议使用DSDV算法，并按需、即只在源节点要发送数据分组时创建/更新路由。  AODV create / update the routing time (hoc On-Demand Distance Vector Routing) protocol uses the DSDV algorithm and demand, that is, only to send data packets at the source node. 这减少了为查找/更新路由所需的广播数。 This reduces to find / update the required number of broadcast routing. 在AODV中，每个节点维护一个检测到的邻节点列表。  In AODV, each node maintains a list of detected neighbor nodes. 邻居列表通过以下三种方式之一进行更新：a)在从邻节点收到分组时，b)通过从邻节点接收本地通告、即问候消息，或者c)通过来自链路层的反馈。 The neighbor list is updated in one of three ways: a) when a packet is received from the neighbor node, b) by receiving local advertisement from the neighbor node, i.e. a greeting message, or c) through feedback from the link layer. 定期从每个节点广播问候消息到其邻节点以将其存在通知其邻节点。 Periodically to notify its presence to its neighbor hello message broadcast from each node to its neighboring nodes. 在AODV中，每个节点维护一个关于所有目的地的路由选择表，节点代表其它节点与每个目的地进行通信或者将数据分组转发到每个目的地。  In AODV, each node maintains a routing table on all the destinations, each node and the destination node on behalf of other communication or forward data packets to each destination. 对于每个目的地，在路由选择表中存在一个项目，它包含有关该目的地的信息，如IP地址、该目的节点的序号、到该目的地的跳数、到该目的地的下一跳节点及路由的寿命。 For each destination, there is an item in the routing table, which contains, as an IP address, destination information about the number of the destination node, hop count to the destination, the next hop to the destination and routing node of life. 一个节点要与目的节点进行通信、即发送数据分组到目的地时，则源节点发起路由发现机制，在该机制中，源节点向所有检测到的邻节点广播路由请求（RREQ)。  node to a destination node with the communication, i.e. the transmission packet data to the destination, the source node initiates a route discovery mechanism, in this mechanism, the source node broadcasts a route request to all neighboring nodes detected (RREQ). 邻节点收到RREQ消息并在其路由选择表中具有关于到该目的地的足够新的路由的项目时，则它将路由回复（RREP)消息发回源节点。 When the neighbor node receives the RREQ message and has enough items on the new route to the destination in its routing table, it will route replies (the RREP) message back to the source node. 如果邻节点未找到关于该目的地的路由项目，则它将RREQ 消息转发到其自己检测到的邻节点。 If the neighbor is not about the destination routing project is found, it will RREQ message to its own detected neighbor nodes. 目的节点收到RREQ时，它返回RREP消息到源节点。 When the destination node receives the RREQ, it returns the RREP message to the source node. 在转发RREQ分组的进程中，每个中间节点记录收到的广播RREQ的第一副本所来自的邻节点的IP地址，由此建立反向路由。  In the process of forwarding the RREQ packet, IP addresses of neighbors of the first copy of the broadcast RREQ each intermediate node from which the received record, thereby establishing a reverse route. 以后收到的相同RREQ消息的副本全部被丢弃。 Copies of the same RREQ messages received later are all discarded in. 中间节点将关于目的地的项目添加到其路由选择表，在表中收到的RREP所来自的邻节点被记录为去往该目的地的下一跳节点。 The intermediate node adds the item to its destination routing table, the neighbor node receives the RREP from the table is recorded as destined for the next hop node for that destination. 目的地序号和路由的寿命从RREP中复制并记录在该项目中。 Destination routing number and lifetime copied and recorded in the project from the RREP. RREP消息最终返回源节点时，形成从源到目的地的前向路由。 When the RREP message back to the source node finally, from source to destination is formed prior to routing. 在节点检测到路由由于路由上关联链路的故障而变得不可用时，它发送路由错误(RERR)消息到使用该路由的所有邻节点。  Since the routing node detects a fault associated routing link becomes unavailable, it sends a route error (the RERR) message to all neighbor nodes of the route. 发送RERR消息到其邻节点，并以此类推，直至RERR消息到达源节点。 RERR message sent to its neighbor, and so on, until the message reaches the source node RERR. 源节点然后可决定是停止发送数据分组还是发起新路由发现。 The source node can then decide whether to stop sending data packets or initiate a new route discovery. DSR(动态源路由选择）协议使用一种源路由选择机制，在该机制中，源节点按需确定沿路由的完整节点序列，并在分组报头中设置中间节点列表以指示路由的节点序列。  DSR (Dynamic Source Routing) protocol uses a source routing mechanism in the mechanism, the source node determines the complete sequence of nodes needed along the route, and an intermediate node list in the packet header indicating the routing node sequence. 这样，每个分组必须承载用于分组路由选择的开销。 Thus, each packet has to carry the overhead for packet routing. 然而，中间节点无需维护任何有关路由的信息，并且它们可在输送数据分组时了解路由。 However, the intermediate node does not maintain any information about the route and they can learn routes when transporting data packets. 在DSR中，每个节点存储（高速缓冲）它已了解的路由。  In DSR, each node stores (caches) the routes it has been understood. 在源节点要发送数据分组到目的节点并且在高速缓冲存储器中无关于该目的地的项目，则它通过在其链路层上广播RREQ消息而发起路由发现机制。 A source node wants to send data packets to the destination node and not the destination item, then it initiates a route by broadcasting the RREQ message on its link-layer found in the cache memory mechanism. 收到RREQ消息的每个节点将其IP地址附加到RREQ消息并然后再将其转发。 Each node receives the RREQ message is its IP address attached to the RREQ message and then forwards. 进行此进程直至找到到目的地的路由或者另一节点可以提供到目的节点的路由。 Make this process until the route to the destination or another node can provide a route to the destination node found. 然后返回包含到目的节点的网络跳序列的路由回复（RREP)消息到源节点。 Then return sequence of network hops to the destination node comprises the route reply (the RREP) message to the source node. 在DSR中，在一个节点检测到链路故障时（即分组已被重新传送最大次数时），该节点将该链路从其路由高速缓冲存储器中删除，并发送路由错误（RERR)消息到自上次收到确认以来已使用该链路的每个节点。 (I.e., when the packet has been retransmitted a maximum number of times)  In DSR, when a node detects a link failure, the node link is deleted from the routing cache memory, and sends a route error (the RERR) since the last received message to confirm that the use of each node for this link. 那些节点必须删除包括该链路的路由。 Those include routing node must delete the link. 来自源节点的数据分组的重新传输然后由诸如传输控制协议（TCP)等高层来处理。 Re-transmission of data packets from the source node is then processed by higher layers such as Transmission Control Protocol (TCP) and the like. TCP/IP协议的一个问题在于它只利用IP地址，并且在以太网或令牌环示例中的数据链路中，网络组件具有其自己的寻址方案，任何使用该数据链路的网络层必须符合该方案。  One problem TCP / IP protocol is that it only using an IP address and a data link in an Ethernet or Token Ring examples, the network components has its own addressing scheme, any use of the data link the network layer must comply with the program. 例如，在以太网中，几个不同的网络层可同时合作，几个网络应用可使用相同的物理电缆。 For example, in an Ethernet several different network layers can cooperate at the same time, several network applications can use the same physical cable. 将以太网帧或分组从一个位置发送到另一位置时，它使用48比特的以太网地址确定分组的目的地和源。 When transmitted from one location to another Ethernet frame or packet, it uses 48-bit Ethernet destination and source address of the packet is determined. 独特的48比特的以太网地址在所有以太网连网硬件中都有，并经常称为MAC地址（介质访问控制）。 Unique 48-bit Ethernet addresses available in all Ethernet networking hardware and often called the MAC address (Media Access Control). 此48比特的地址可与IPv4(因特网协议版本4)中使用的32比特的IP地址相比较。 This 48-bit address with the IPv4 (Internet Protocol version 4) IP address of 32 bits used in the comparison. 地址解析提供了这两种不同形式的地址之间的映射方案。 Address resolution provides a mapping scheme between the two different forms of address. 此映射由ARP(地址解析协议）完成。 This mapping is done by the ARP (Address Resolution Protocol). ARP提供以下机制，在称为ARP高速缓冲存储器的暂时存储器空间中将硬件MAC地址动态映射到IP地址。 ARP provides the following mechanism, in the temporary memory space called the ARP hardware MAC address in the cache memory is dynamically mapped to an IP address. 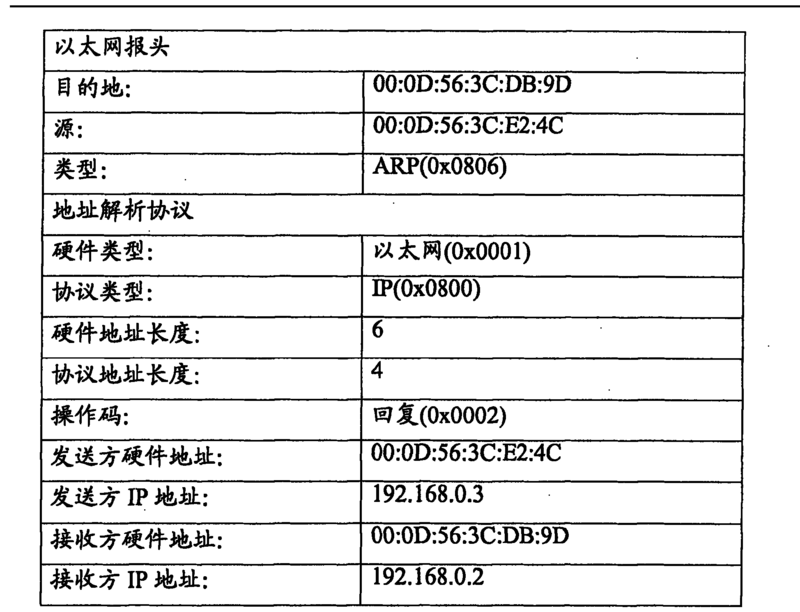 换而言之，ARP将IP地址转换成MAC地址。 In other words, ARP translates the IP address into a MAC address. ARP的基本操作如下：在IP层要与网络上的另一装置进行通信时，它检查ARP高速缓冲存储器（以了解是否存在以太网地址的匹配项）。  ARP basic operation is as follows: when the IP layer wants to communicate with another device on the network, it checks the ARP cache (if there is an Ethernet address for a match). 如果在ARP高速缓冲存储器中无匹配项目，则发出ARP广播数据报，基本上内容为：“具有此IP地址的装置，回复您的以太网地址？ ”。 If there is no matching entry in the ARP cache, then sends an ARP broadcast datagram, basically says: "This device has an IP address, respond to your Ethernet address?." (具有该IP地址的）接收站以如下ARP数据报响应，内容为：“这是我的IP地址，并且以下是我的以太网地址”。 (Having the IP address) to a receiving station as ARP datagram response, says: "This is my IP address, and the following is my Ethernet address." 更新ARP高速缓冲存储器，并且将原始IP层信息传递到MAC层以作处理。 Update the ARP cache, and transmits the information to the original IP layer to the MAC layer for processing. 此方案对于固定线路网络效果良好，但在无线自组织和/或多跳网络中，不是所有网络单元可相互听到，这种情况下，标准ARP解决方案将不足以解决问题。  This scheme works well for fixed line networks, but in wireless ad hoc and / or multihop networks not all network units can hear each other, in this case, the standard ARP solution will not solve the problem. 为此，开发了一些不同的2. 5层解决方案用于映射IP地址和MAC地址。 For this reason, the development of a number of different layers of 2.5 solution for mapping IP address and MAC address. 1.轻型底层网络（Lightweight Underlay Network, LUNAR)。  1. Light underlying network (Lightweight Underlay Network, LUNAR). ARP 业务由转换底层网络（Translating Underlay Network, SelNet)捕获并改写成可扩展解析协议(extensible Resolution Protocol，XRP)，而不是利用纯ARP。 ARP underlying network services are captured by the converter (Translating Underlay Network, SelNet) to be rewritten and extended resolution protocol (extensible Resolution Protocol, XRP), instead of using pure ARP. XRP 允许比标准ARP 丰富得多的表达式集。 XRP ARP allows much richer than the standard set of expressions. 为维护LUNAR中的路由，每隔两秒清除所有路由，并且重新进行路径发现过程。 To maintain the routing LUNAR, every two seconds to clear all routes, and re-route discovery process. 2.第2层DSR(原版本）。  2. Layer 2 DSR (original version). 在路由发现进程中，用于路由选择的分组类似于ARPJfi 记录沿途的所有节点地址。 Packet routing discovery process, similar to that used for routing node address ARPJfi records all along the way. 由于协议是源路由选择协议，因此，还将整个路由添加到数据分组的每个报头。 Since the source routing protocol is a protocol, therefore, the whole routing will be added to the header of each data packet. 此类地址的数量有限，并因而导致跳数有限。 A limited number of such addresses, and thus lead to a limited number of hops. 路由维护的操作是通过为传送的每个数据分组逐跳检测确认（ack. )。 Route maintenance operation is performed by the data transmission for each packet detected hop acknowledgment (ack.). 未获得确认时，重新传送该分组一定的次数，直至认为链路断开，并且搜索另一路由。 When confirmation is not obtained, the packet is retransmitted a certain number of times, until that link is broken, and the search for another route. 1.标准ARP只可用于无线网络中的本地对等通信。  1. Standard ARP can only be used in a local wireless network peer to peer communications. 2.在自组织路由选择协议中通常不再使用网络中的分组。  2. The network packet is generally no longer used in the ad-hoc routing protocol. 3. LUNAR协议限于网络小区中总数最多10_15个节点和最多3跳。  3. LUNAR protocol up to the total number of cells is limited to the network nodes and a maximum of 3 10_15 hops. 为保存更新的映射表，它经常淹没网络，这导致附加的控制业务。 To save the updated mapping table, it is often flood the network, which leads to additional control business. 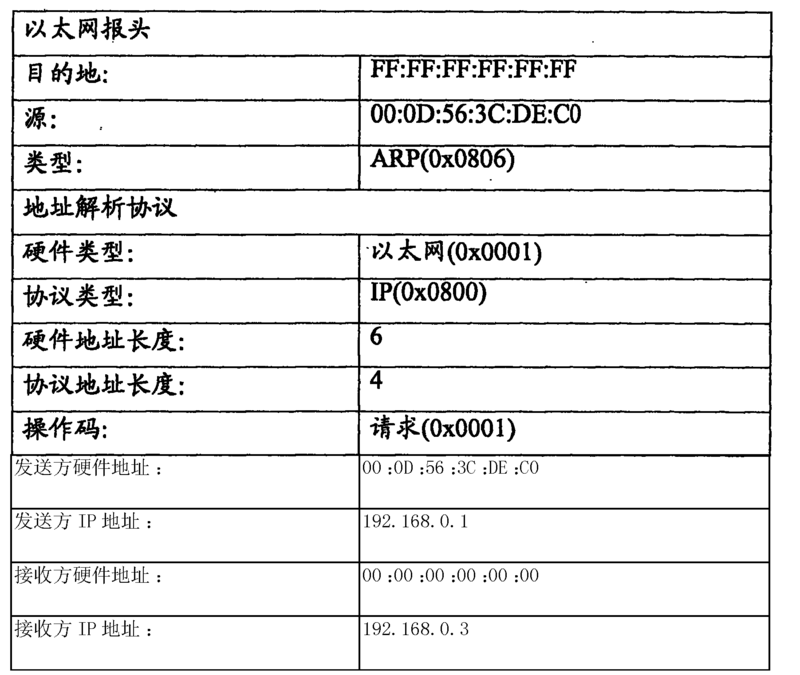 此外，它利用外部附加的协议实现多跳功能。 In addition, it uses an external additional protocol multi-hop capabilities. 4.第2层上的DSR限于某一跳数，这是因为所有网络地址存储在所有分组（数据分组和控制业务分组两者）中。  4. DSR second layer on a limited number of hops, since all the network address storage (both packet data and control traffic packets) in all packets. 此解决方案需要附加的资源，并且引入新的类似于ARP的协议。 This solution requires additional resources, and the introduction of a new protocol is similar to the ARP. 相应地，上述解决方案在基于标准IP的网络中不会是透明的，并会从可用的网络资源和涉及的路由选择组件的计算能力两者中占用额外的资源。  Accordingly, the above-described solutions based on standard IP networks not be transparent and will take up extra resources both from the available computing power and network routing resources involved in the assembly. 发明内容 因此，本发明优选实施例的一个目的是纠正上述问题和缺陷中的至少一些。 An object of the invention  Accordingly, preferred embodiments of the present invention is to remedy at least some of the aforementioned problems and disadvantages of the. 这通过在ARP消息中引入新特性但不更改ARP消息结构而得以实现。  However, this does not change the ARP message structure through the introduction of new features in the ARP message is achieved. 这样，使用标准ARP功能的网络组件不会受此新ARP消息结构的影响。 Thus, using the standard ARP function network components are not affected by the new ARP message structure. 然而，使用根据本发明的ARP 解决方案的网络组件将能够利用有效的ARP映射。 However, network components using the ARP solutions of the present invention will be able to effectively use the ARP. 在本发明的一个优选实施例中，为无线多跳数据通信网络提供一种用于“地址解析映射”的方法，该方法包括以下步骤：将地址解析协议（ARP)请求从第一网络节点广播到第二节点；第二节点接收ARP请求、确定ARP消息的目的地；在ARP请求被确定为是到第三节点去时传送ARP请求；以及将ARP回复从目的网络节点经中间网络节点转发到第一网络节点。  In a preferred embodiment of the present invention, there is provided a method for the "address resolution mapping" for a wireless multihop data communication network, the method comprising the steps of: Address Resolution Protocol (ARP) request from a first broadcast network node to a second node; a second node receives the ARP request determining the destination of the ARP message; in the ARP request is determined to be transmitted to the ARP request to a third node; and an ARP reply from the destination network node via intermediary network a first node to the network node forwards. 该方法还包括在节点中存储的、检测到的先前ARP请求和ARP转发的未决列表。  The method further comprises storing in the pending list node, the previous detected ARP requests and ARP forwarding. 该方法还可包括以下步骤：限制在未决列表中存储的先前ARP请求或转发的存储时间，限制允许节点发送到特定目的地的ARP转发的速率，在ARP消息过程期间测量节点之间的链路质量并将链路质量信息分发到节点，使用链路质量信息确定何时应更新ARP表， 将链路质量信息与阈值进行比较以便确定是否要进行更新，以及在转播或转发ARP请求前修改ARP请求。  The method may further comprise the steps of: limiting the pending list stored in the previous ARP requests or forwards the storage time, the rate limit is allowed to transmit to a specific destination ARP forwarding node during the measurement process of the ARP message link quality and distributing link quality information between the nodes, using the link quality information to determine when to update the ARP table, the link quality information with a threshold value to determine whether or not to update, as well as broadcast ARP forwarding or ARP request prior to modification request. 根据该方法，在一个节点无法与某个节点进行通信时，可生成ARP错误消息并分发到网络中的侦听节点。  According to this method, when a node can not communicate with a certain node, ARP error message may be generated and distributed to listening nodes in the network. 在本发明的另一实施例中，提供一种通信装置，其中该装置在多跳无线网络中具有路由选择工具，并且该装置包括：指令集存储器；至少一个无线收发信机；用于在指令集存储器中提供地址解析协议（ARP)指令的工具；以及用于在指令集存储器中提供ARP消息转发和转播指令的工具。  In another embodiment of the present invention, there is provided a communication apparatus, wherein the device has routing means in a multihop wireless network, and the device comprising: an instruction set memory; at least one wireless transceiver; with for providing address resolution protocol (ARP) for the instructions in the instruction set memory; and means for providing ARP message forwarding and rebroadcasting instructions in the instruction set of tool memory. 在该装置中，用于ARP转发和广播的工具可包括用于确定ARP消息的目的地的工具。  In this device, the ARP forwarding and broadcasting means may comprise means for determining the destination of the ARP message is used. 该装置可以为诸如但不限于膝上型计算机、个人计算机（PC)、个人数字助理(PDA)、移动电话或嵌入式计算机等客户端系统或诸如但不限于WLAN(无线局域网）基础设施装置及移动电话基础设施装置等基础设施系统。  The device may be such as but not limited to a laptop computer, a personal computer (PC), a personal digital assistant (PDA), a mobile phone, or embedded computer or other client systems, such as but not limited to, WLAN (Wireless Local Area Network) base infrastructure facilities and a mobile telephone system infrastructure devices. ARP转发或转播指令可修改ARP消息以显现为源于修改消息的装置。  ARP forwarding or rebroadcasting instructions may modify ARP message to appear to modify the device is derived from the message. 在本发明仍有的另一实施例中，提供一种用于多跳无线数据通信的系统，该系统包括：多个通信装置；这些通信装置包括：指令集存储器；至少一个无线收发信机；用于在指令集存储器中提供地址解析协议（ARP)指令的工具；以及用于在指令集存储器中提供ARP转发和转播指令的工具；以及由这些通信装置组建的通信网络。  In still another embodiment of the present invention, there is provided a system for multihop wireless data communication, the system comprising: a plurality of communication devices; the communication apparatus comprising: an instruction set memory; at least one wireless transceiver letter machine; means for providing address resolution protocol (ARP) for the instructions in the instruction set memory; and means for providing ARP forwarding in the instruction set memory and rebroadcasting instructions tool; and a communication network set up by the communication means. 该数据通信系统中的通信装置还包括用于确定ARP消息的目的地的工具。  The communication apparatus of a data communication system further includes determining the destination of ARP message for a tool. 该通信装置可以为客户端系统、基础设施系统或这两种类型的装置的组合。  The communication terminal apparatus may be a combination of client systems, infrastructure systems, or both types of devices. 客户端系统的示例可以为但不限于膝上型计算机、个人计算机（PC)、个人数字助理（PDA)、移动电话或嵌入式计算机。 Examples of client system may be, but are not limited to, a laptop computer, a personal computer (PC), a personal digital assistant (PDA), a mobile phone or embedded computer. 基础设施系统的示例可以为但不限于WALN(无线局域网）基础设施装置和移动电话基础设施装置。 Example infrastructure systems may be, but is not limited to WALN (Wireless Local Area Network) infrastructure devices, and mobile phone infrastructure devices. 该系统还可包括至少一个连接到诸如因特网或专用IP网络等外部网络的网关。  The system may further comprise at least one connection to an external network such as the Internet or a private IP network gateway. 本发明还涉及一种在无线多跳数据通信网络中用于“地址解析映射”的指令集，该指令集包括：用于将地址解析协议（ARP)请求从第一网络节点广播到第二节点的第一指令集；在第二节点中用于接收ARP请求、确定ARP消息的目的地的第二指令集；在ARP请求被确定为是到第三节点去时传送ARP请求的第三指令集；以及用于将ARP回复从第三节点经第二节点转发到第一网络节点的第四指令集。  The present invention further relates to a set of instructions for the "address resolution mapping" in a wireless multihop data communication network, the set of instructions comprising: an address resolution protocol (ARP) request from a first network node to broadcast a first instruction set of the second node; a second set of instructions in the second node for receiving the ARP request determining the destination of the ARP message; in the ARP request is determined to be the first time to the ARP request transmitted to the third node three instruction set; and forwarding ARP replies from the second node to the third node via a first network node for the fourth instruction set. 图1以示意图方式示出小型多跳网络。  FIG. 1 schematically shows a small multihop network. 图2是通过小型多跳网络带有不同通信消息的流程图。  FIG 2 is a flowchart of messages with different communication through a small multihop network. 图3示出ARP消息的示意性消息结构。  FIG 3 illustrates a schematic message structure of the ARP message. 图4示出与固定网络连接的更大型多跳无线网络的示意图。  FIG. 4 shows a schematic view of a larger multihop wireless network is connected to the fixed network. 本发明涉及移动自组织网络的概念，其中移动节点的自组织无线网络通过使用所谓的多跳路由选择系统相互进行通信。  The present invention relates to the concept of mobile ad hoc network, wherein the mobile node ad hoc wireless network with each other using a so called multihop routing system communication. 这些节点既充当主机/客户端系统，又充当路由器， 即基础设施装置。 These nodes act as both host / client system, and as a router, ie infrastructure devices. 经这些节点对业务进行路由选择，并在必要时路由选择到可接入例如因特网等外部IP网络的外部网关。 These nodes by routing traffic, and routed to the external gateway can access an external IP network such as the Internet when necessary. 在本发明中，提供一种关于ARP (地址解析协议)的新解决方案，其中通过使用位于ARP请求节点与ARP消息的最终接收方之间的路径上的中间节点，将ARP消息转发到接收方节点。  In the present invention, there is provided a new solution on ARP (Address Resolution Protocol), which is located by use of an intermediate node on the path between the final node and the recipient ARP Request ARP message, the message forwarding ARP to the receiving node. 在图1中，示出多跳无线网络的多个网络节点101、102、103和104。  In FIG. 1, a multi-hop wireless network and a plurality of network nodes 101,102, 103, 104. 这些节点101、 102、103和104相互进行通信，然而，并非所有节点相互有联系。 These nodes 101, 102, 103 and 104 communicate with each other, however not all nodes have contact with each other. 这意味着在一些情况下一些节点会中继消息并充当路由选择单元。 This means that in some cases some of the nodes will relay messages and act as routing elements. 例如，如果节点101要与节点104进行通信，则节点102或节点102和103需要参与分组交易，这是因为节点101和104无法在此情况下直接相互“听到”，即无法直接相互进行通信。 For example, if node 101 wants to communicate with node 104, the node 102 or nodes 102 and 103 need to be involved packet transaction, since nodes 101 and 104 can not directly to each other "hear" In this case, it can not communicate directly with each other . 要将消息从一个节点发送到另一节点时，需要解析这些节点的网络地址。 When  To send a message from one node to another, we need to resolve network addresses of the nodes. 在本发明中，提出一种新ARP过程，其中添加新ARP消息以使ARP消息结构变化，从而实现ARP转发或转播。 In the present invention proposes a new ARP procedures, add new ARP message to make structural changes ARP message, or forwarding ARP broadcast to achieve. 这意味着位于需要相互知道网络地址的两个节点之间的节点会转发此类ARP请求，直至ARP请求到达寻求的目的地。 This means that you need to know each other node located between two nodes of the network address of the forward such ARP requests until the ARP request reaches the destination sought. 1.节点101要发送数据到节点104。  1. The node 101 wants to send data to the node 104. 2.节点101自动广播ARP请求：“谁是104，告诉101 ？ ”。  2. node 101 automatically broadcasts an ARP request: "Who is 104, tell 101?." 3.此消息由相邻节点102接收，该节点立即转播请求：“谁是104，告诉102 ？ ”。  3. This message is received by the adjacent node 102, the node immediately broadcast request: "Who is 104, tell 102?." 4.此请求由相邻节点103接收，该节点转播请求：“谁是104，告诉103 ？ ”。  4. The request is received by the neighboring node 103, the node rebroadcasts the request: "Who is 104, tell 103?." 然而， 在此特定情况下，节点104也收到该请求，节点104通过发送：“节点102，我是104”来回复。 However, in this particular case, the node 104 receives the request, node 104 by sending: "Node 102, I am 104" replies. 5.节点103传送的请求由节点104接收，该节点通过发送：“节点103，我是104” 来回复。  5. The request 103 transmitted by node 104 is received by the node, the sending node: "node 103, I 104" replies. 6.从节点104到节点102的回复由节点102接收。  6. The received reply from node 104 to node 102 from node 102. 7.节点102通过发送ARP转发：“节点101，使用节点102作为到节点104的网关” 而回复请求的起源（节点101)。  7. The forwarding node 102 by sending ARP: "Node 101, use node 102 as gateway to node 104 'and the reply request origin (node ​​101). 8.从节点104到节点103的回复由节点103接收。  The receiving reply from node 103 to node 104 by node 103. 节点103通过发送：“节点102， 使用节点103作为到节点104的网关”而回复节点102。 Node 103 by sending: "Node 102, use node 103 as gateway to node 104 'and the node 102 replies. 在如图2所示的另一示例中，在小型网络中连接三个节点001、202、203)。  In another example shown in Figure 2, three nodes are connected in a small network 001,202,203). 节点201要与节点203进行通信，但无法直接进行通信。 Node 201 wants to communicate with node 203, but can not communicate directly. 然而，节点202的位置使得它可在节点201与203之间中继消息。 However, the node 202 at a position such that it can relay messages between node 201 and 203. 在图2中，节点201要发送通常称为PING的ICMP(因特网控制消息协议）回送请求到节点203。 In FIG 2, node 201 is commonly referred to send ICMP PING (Internet Control Message Protocol) echo request to the node 203. 图2中的消息框205、207、211和213指示根据本发明在这些节点之间传递的新消息类型。 FIG 2 is a message box indicating the new message types 205,207,211 and 213 of the present invention is transmitted between these nodes. FIG. 1.节点201开始其通信过程时，它先发送ARP消息，请求它要与其进行通信的IP 号码的位置。  1. The node 201 starts its communication procedure it first sends an ARP message, requesting it to position its IP number for communication. 这在方框204中示出。 This is shown in block 204. 2.此ARP请求由节点202接收。  2. This ARP request is received by node 202. 节点202确定消息是指定给另一节点而不是其本身。 Node 202 determines that the message is assigned to another node than itself. 改变消息以显现为源于节点202，并如方框205中所示由节点202转播。 Change message to appear to come from node 202, and relay 202 as shown in block 205 by the node. 3.消息由节点203接收，并且将ARP回复发送到节点202 (方框206)，以及节点202将ARP回复转发到节点201 (方框207)。  3. The message is received by node 203 and an ARP reply is sent to node 202 (block 206), and node 202 forwards the ARP reply to node 201 (block 207). 4.节点201然后具有节点203的坐标，并发送ICMP请求到节点203 (方框208)， 并且ICMP请求由节点202中继（方框209)。  4. Node 201 then has the coordinates of the node 203, and sends the ICMP request to node 203 (block 208), and ICMP requests from the relay node 202 (block 209). 6.此消息由节点202接收。  6. This message is received by node 202. 节点202确定消息是指定给另一节点而不是其本身。 Node 202 determines that the message is assigned to another node than itself. 改变消息以显现为源于节点202，并如方框211所示由节点202转播。 Change message to appear to come from node 202, and 211 as shown in block broadcast by the node 202. 7.消息由节点201接收，并且将ARP回复发送到节点202(方框212)，以及节点202将应答转发到节点203 (方框213)。  7. The message is received by node 201 and an ARP reply is sent to node 202 (block 212), and node 202 forwards the response to the node 203 (block 213). 8.节点203然后具有节点201的坐标，并发送ICMP回复（方框214)，该回复由节点202中继（方框215)到节点201，并且ICMP通信过程得以结束。  8. Node 203 then has the coordinates of the node 201, and sends the ICMP reply (block 214), the reply from the relay node 202 (block 215) to node 201, and the ICMP communication procedure is ended. 上述通信方法已通过ICMP回送请求示出，但本领域的技术人员应理解，在本发明的范围内可使用任何类型的通信过程、协议或方案。  By the above-described communication method has been shown ICMP echo request, those skilled in the art will appreciate, any type of communication procedure within the scope of the present invention, the protocol or scheme. 此外，本领域的技术人员应理解，在通信网络和业务交易中可涉及不止三个节点。 Moreover, those skilled in the art will appreciate that, in the communication network and business transactions may involve more than three nodes. ARP转发：如果此类型包括在ARP消息的op字段中，则任何具有根据本发明的实施的路由选择装置理解此消息是ARP转发消息，并将它作为ARP回复处理，但在消息处理方面有一些不同。  ARP forwarding: if the type comprising op fields of the ARP message, the routing device of any embodiment having understood that the present invention according to this message is an ARP message forwarding and handling it as an ARP reply, but the message processing there are a number of different aspects. 它还是本发明中引入的ARP转发方案实施中的一个功能。 It is also a feature of the present embodiment ARP forwarding scheme introduced in the invention. 此功能中继路由选择到节点。 This routing function to the relay node. 消息包含最终目的地及离最终目的地最近的跳是谁。 The message contains the final destination and away from the final destination who recently hop yes. 在节点认识到它无法与某个节点进行通信时，生成ARP错误。  When the node recognizes that it can not communicate with a certain node, generates an ARP error. 这在节点无法找到任何到某个寻求的节点的替代路由时生成。 This can not be found in any node is generated when seeking alternative routes to a node. 将ARP错误消息广播（到相邻节点，即单跳邻居），并且ARP错误消息包含有关哪个节点生成该错误消息及无法到达的节点的信息。 The error message broadcast ARP (to adjacent nodes, namely single-hop neighbors), and ARP error message contains information about which node generated the error message and can not reach the node. ARP 错误生成节点删除包含丢失节点的路由的所有项目和丢失节点充当网关的所有路由。 All lost items and delete nodes ARP error generating node containing the missing node acts as a routing all routing gateways. 广播的ARP错误消息的接收方删除包含丢失节点的所有活动路由。 The recipient to delete all active routes containing the missing node ARP error message broadcast. 如果在接收节点中不存在替代路由，则生成ARP错误消息并广播。 If no alternative routes exist in the receiving node, ARP error message is generated and broadcasted. ARP链路质量消息包含有关两个节点之间的链路质量的信息。  ARP link quality message contains information about the link quality between two nodes. 还应考虑的是，中间节点转播的消息还由通信链中前面的节点接收。  It should also be contemplated that the intermediate node also relay the message received by the previous node in the communication chain. 在图2的示例中，节点202转播ARP请求时，节点201将收到相同的消息。 In the example of FIG. 2, when the broadcast ARP request node 202, node 201 will receive the same message. 为减少控制业务量，每个节点可通过在每个节点本地存储未决列表而记录每个请求和回复。 To reduce the amount of control traffic, each node may be stored locally in each node pending list recorded by each of the requests and replies. 通过在转发ARP请求前查看此最近请求和回复的列表，节点可能能够减少在网络基础设施上广播的控制业务量。 By looking at this list of recent requests and replies before forwarding ARP request, the node may be able to reduce the traffic control on the broadcast network infrastructure. 如果收到的消息被确定为是关于已经在未决列表中的节点集，则它将被丢弃。 If the received message is determined to be the set of nodes already on the pending list, it will be discarded. 在未决列表中， 存储有关哪个节点在请求哪个节点、发出此请求的时间、是否已收到回复及是否已将回复转发到另一节点等信息。 In the pending list, which stores information about the time at which node node request, issued this request, whether the reply has been received and whether the information has been forwarded to reply to another node and so on. 在该解决方案中，还可能引入有关节点可以多快地转播到特定节点去的请求的时间限制。  In this solution, it is also possible to introduce the relevant relay node may limit the time a request to a specific node how fast. 在请求遍历两个或更多个不同的路径并在某个节点接收时，只应转发它一次。 When two or more requests to traverse different paths and received at a node, it should be forwarded only once. 这通过在某个时间限制内不允许节点将请求转发到特定节点而得以解决。 This is solved by a certain time limit does not allow node forwards the request to a specific node. 反之亦然，只要未发送转播，便只允许发送ARP回复或转发消息一次到每个起源。 And vice versa, as long as the broadcast is not sent, then only allowed to send ARP reply to or forward messages once every origin. 由于本发明不更改ARP标准，因此，无需专门的ARP发起例程。  Since the present invention does not change the standard ARP, therefore, no special initiation routine ARP. 然而，在本发明的另一实施例中，可将链路质量监控系统与上述ARP解决方案一起引入以便进一步减少控制业务量和提高业务速度。 However, in this embodiment, the link quality monitoring system may be the above-mentioned ARP introduced together solutions to further reduce the amount of control traffic and increasing the speed of operations in another embodiment of the present invention. 通过测量节点之间的链路质量，例如无线电质量、确认信息、误码率或数据率吞吐量（例如根据传输控制协议TCP)，在检测到链路质量下降时主动更新ARP清单是可能的。 By measuring the link quality between nodes, for example radio quality, acknowledgment information, bit error rate or data rate throughput (e.g. according to the transmission control protocol TCP), it is detected in the active list update ARP link quality drops are possible. 此类方案可减少丢失数据分组量，并减少基础设施中的控制业务量。 Such programs can reduce the amount of lost data packets, and reduce the amount of control traffic infrastructure. 在PCT/ SE03/002074(通过引用结合于本文中）中，介绍了一种在自组织网络中用于链路质量监督的类似方案，并且该方案通过引用结合于本文中。 In PCT / SE03 / 002074 (incorporated by reference herein), there is described a similar scheme for link quality surveillance in an ad hoc network, and the program incorporated by reference herein. 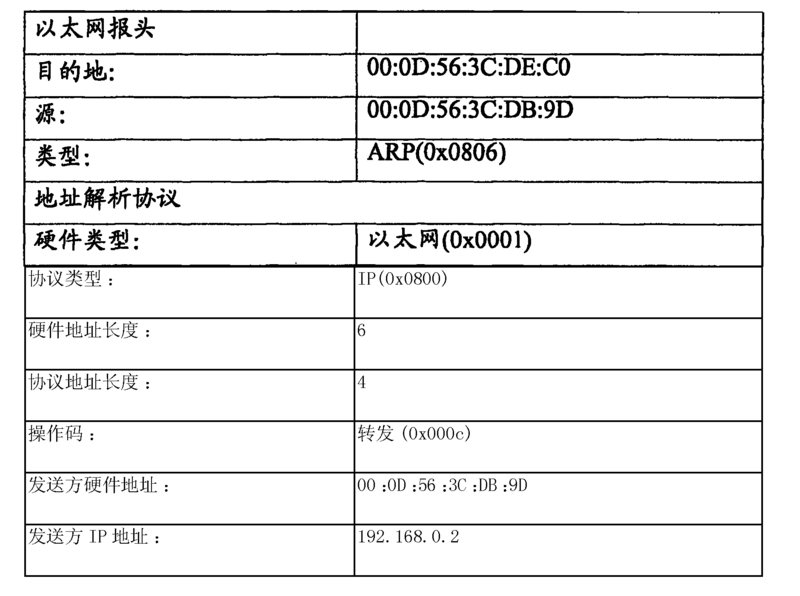 相同的系统可用于决定何时更新ARP表。 The same system may be used to decide when to update the ARP table. 根据本发明的ARP实施中的可控参数包括但不限于节点隔多久可以发送ARP请求、未决列表中项目有效的时长及允许存储在ARP路由选择表中未使用的路由选择项目保留在ARP路由选择表中的时间量。  including but not limited to how often a node may send an ARP request according to the ARP embodiment of the present invention is controllable parameters, the pending list item and allows the effective length of time a routing entry in the ARP routing table stored unused reserved the amount of time in the ARP routing table. 将请求存储在接收节点中，这样，在从其它节点收到回复时，接收节点可发送回复到请求节点。  The request is stored in the receiving node, so that, when the reply is received from other nodes, the receiving node may send a reply to the requesting node. 节点可以为任何计算装置，包括但不限于膝上型计算机、个人数字助理（PDA)、嵌入式计算机或移动电话。  node may be any computing device, including but not limited to, a laptop computer, a personal digital assistant (PDA), embedded computer, or mobile phone. 此类装置包括至少一个无线收发信机和指令集存储器，该指令集存储器带有处理地址解析协议指令和地址解析协议转发与转播指令的编程代码。 Such devices include at least one wireless transceiver and an instruction set memory, the instruction memory with a set of instructions and processing address resolution protocol ARP forwarding and rebroadcasting instructions in the programming code. 该装置还包括在指令集存储器中用于确定消息的最终目的地的工具和用于根据本发明修改ARP消息的工具。 The apparatus further comprises means to determine the final destination for the message and modify the ARP message according to the present invention the tool for the instruction set memory. 本发明既可用于不提供外部连接的独立网络，如在灾难地区网络建立或战场上的军事网络建立中，也可用于连接在一起的无线组件群集，并且在群集中存在至少一个到外部网络（例如因特网或独立IP网络）的连接。  The present invention can be used independently of the network does not provide an external connection, such as the establishment or military network setup on the battlefield network in a disaster area, it can also be used for wireless components connected together in a cluster, and there is at least concentrated in a cluster to an external network (e.g. Internet or an independent IP network) connection. 图4中示出后一情况的实施例，其中，多个无线组件602. .. 60η (其中η是整数)连接到网关607，该网关具有到例如因特网等外部网络的连接。 In the embodiment shown in FIG. 4 the latter case, wherein the plurality of wireless components 602. .. 60η (where η is an integer) connected to the gateway 607, the gateway has a connection to an external network such as the Internet. 外部连接600可以为任何类型，包括但不限于固定有线连接（例如以太网、光纤或类似连接）或固定无线（例如LMDS)。 The external connection 600 may include but is not limited to a fixed wired connection (e.g., Ethernet, fiber optic connection, or the like) of any type of wireless or fixed (e.g. LMDS). 该通信方案独立于使用的无线电编码方案，并且可使用任何无线电类型。  The radio communication scheme coding scheme use independent, and any radio type may be used. 例如，在IEEE 802. 11 系列(例如IEEE 802. lla、IEEE802. lib、IEEE 802. Ilg 等等）、IEEE 802. 15、 IEEE 802. 16、HiperLAN、HomeRF、蓝牙、IR (红外)、UWB (超宽带)、JTRS (联合战术无线电系统）、3G (第三代移动通信)、GPRS (通用分组无线电业务)或EDGE (全球演进的增强型数据率）中的无线电标准。 For example, in the IEEE 802. 11 series (e.g., IEEE 802. lla, IEEE802. Lib, IEEE 802. Ilg, etc. ), IEEE 802. 15, IEEE 802. 16, HiperLAN, HomeRF, Bluetooth, the IR (infrared), the UWB ( ultra-wideband), JTRS (joint tactical radio system), 3G (third generation mobile communication), GPRS (General packet radio service) or EDGE (enhanced data for global Evolution rate) in the radio standard. 然而，可能的无线电标准不限于以上所述。 However, the possible radio standards are not limited to the above. 它可以为在IOOkHz到IOOPHz的频带内操作的任何合适的基于电磁辐射的传输方案；这包括无线电频率、微波频率和红外范围、可见范围和紫外范围中的频率。 It may be any suitable electromagnetic radiation based transmission scheme operating within the frequency band to IOOPHz IOOkHz; this includes frequency radio frequency, microwave frequency and infrared range, visible range and the ultraviolet range. 根据本发明的ARP方法可在许多不同的应用领域中使用，如一般情况下或特殊事件期间由警察使用，灾难或意外期间由救援部队使用，在战场上或训练中由军队使用，或者用于为住宅和商业网络接入构建通信用无线接入区。  can be used according to the ARP method of the invention in many different application areas, such as general or during special events used by the police, during a disaster or accidental use by the rescue forces, the use by the military on the battlefield or training, or used to build residential and commercial network access wireless communication access zone. 例如，使用这些自组织网络在其它宽带接入技术稀少或太昂贵难以连接的住宅区中使用近距离、低成本的无线设备组建宽带接入是可能的。 For example, the use of these short-range ad hoc networks used in residential areas other broadband access technology is scarce or too expensive hard connection, the formation of low-cost wireless broadband access devices is possible. 它还可用于商业区，用于提供到企业或小型公司的宽带接入，或用于在所谓热点的无线连接。 It can also be used in commercial districts for either providing enterprises or small companies to broadband access, or so-called hotspots for wireless connection. 热点的特征在于它们根据商业模型为付费客户或免费在某个区域内提供通信接入，例如，在机场候机厅或酒店中。 Characterized by hot spots is that they provide free communication access business model is based on paying customers or within a certain area, for example, in an airport lounge or in the hotel. 即使在上述示例中为说明本发明使用了三或四个节点，但本领域的技术人员也应理解在此类网络安装中可使用更多或更少数量的节点。  Even in the example above to illustrate the present invention uses three or four nodes, those skilled in the art may be used should also be understood that more or less number of nodes in such a network installation. 对涉及的节点数量没有特殊限制。 There is no particular restriction on the number of nodes involved. 虽然出于说明的目的而详细描述了本发明，但应理解上述细节只是为了该目的， 并且在不脱离本发明精神和范围的情况下，本领域的技术人员可在其中进行变化，本发明的精神和范围可受随附权利要求书的限制。  While for purposes of illustration of the present invention is described in detail, it is to be understood that such detail is solely for that purpose, and without departing from the spirit and scope of the invention, those skilled in the art can vary therein, the spirit and scope of the present invention may be subject of the claims appended hereto appended. 1. 一种用于在无线多跳数据通信网络中“地址解析映射”的方法，所述方法包括以下步骤：-将地址解析协议ARP请求从第一网络节点广播到第二节点，其中，在所述ARP请求的操作码字段部分中插入了消息类型码；-在接收所述ARP请求的所述第二节点中确定所述ARP请求的目的地；-所述第二节点在所述ARP请求被确定为是到第三节点去时传送所述ARP请求；以及-所述第二节点使用ARP回复的操作码字段中指示转发ARP回复的消息类型码将所述ARP回复从所述第三节点转发到所述第一网络节点。 A method in a wireless multihop data communication network "address resolution mapping", the method comprising the steps of: - broadcasting an address resolution protocol ARP request from a first network node to the second node, wherein the opcode field of the ARP request message type code inserted; - ARP request determining the destination of the second node receives the ARP request; - the second node in said ARP request is determined to be transmitted to the third point of time to the ARP request; and - the second node using ARP reply opcode field indicates ARP reply forwarding the message type code from said third node an ARP reply forwarded to the first network node. 2.如权利要求1所述的方法，其中所述第二节点包括多个节点。 2. The method according to claim 1, wherein said second node comprises a plurality of nodes. 3.如权利要求1所述的方法，还包括在所述第一网络节点、所述第二节点和所述第三节点中存储检测到的先前ARP请求和ARP转发的未决列表。 The method according to claim 1, further comprising the first network node, the second list of previously pending ARP requests and ARP forwarding node and the third node stored detected. 4.如权利要求3所述的方法，还包括以下步骤：对所存储的先前ARP请求或转发在所述未决列表中的存储时间设定时间限制。 The stored previous ARP requests or forwards the storage time in the pending list set time limits: 4. A method as claimed in claim 3, further comprising the following steps. 5.如权利要求1所述的方法，还包括以下步骤：设定允许节点发送到特定目的地的ARP 转发的速率限制。 5. The method according to claim 1, further comprising the step of: setting the rate is allowed to transmit to a specific destination ARP forwarding restrictions. 6.如权利要求1所述的方法，还包括以下步骤：在ARP消息过程期间测量节点之间的链路质量并将链路质量信息分发到节点。 6. The method according to claim 1, further comprising the step of: during the measurement node between the ARP link quality message and distributing link quality information to the node. 7.如权利要求6所述的方法，其中所述链路质量信息至少包括确认信息、无线电链路质量、数据率吞吐量及误码率之一。 7. The method according to claim 6, wherein the link quality information includes at least one of acknowledgment information, radio link quality, error rate and the throughput data rate. 8.如权利要求6或7所述的方法，还包括以下步骤：使用所述链路质量信息确定何时应更新ARP表。 8. The method of claim 6 or claim 7, further comprising the step of: using the link quality information to determine when to update the ARP table. 9.如权利要求6或7所述的方法，还包括以下步骤：将所述链路质量信息与阈值进行比较以便确定是否要进行更新。 9. The method of claim 6 or claim 7, further comprising the step of: the link quality information with a threshold value to determine whether or not to be updated. 10.如权利要求1所述的方法，其中在一个节点无法与某个节点进行通信时，生成ARP 错误消息并分发到所述网络中的侦听节点。 10. The method according to claim 1, wherein when a node can not communicate with a certain node, ARP error message is generated and distributed to listening nodes in the network. 11.如权利要求1所述的方法，还包括所述第二节点在转播或转发所述ARP请求前修改所述ARP请求。 11. The method as claimed in claim 1, further comprising prior to the second node forwarding the broadcast ARP request or the ARP request modification. 12. 一种用于在无线多跳数据通信网络中“地址解析映射”的设备，所述设备包括：-用于将地址解析协议ARP请求从第一网络节点广播到第二节点的部件，其中，在所述ARP请求的操作码字段部分中插入了消息类型码；-用于在接收所述ARP请求的所述第二节点中确定所述ARP请求的目的地的部件；-用于所述第二节点在所述ARP请求被确定为是到第三节点去时传送所述ARP请求的部件；以及-用于所述第二节点使用ARP回复的操作码字段中指示转发ARP回复的消息类型码将所述ARP回复从所述第三节点转发到所述第一网络节点的部件。 12. A method for a wireless multihop data communication network "address resolution mapping" of the apparatus, the apparatus comprising: - means for an address resolution protocol ARP request broadcast member from a first network node to a second node, wherein , the operation code field in the insertion portion of the ARP request message type code; - means for determining the destination of the ARP request is received at the second node of said ARP request; - for the the second node of said ARP request is determined to be a member of the transmission to the third point of time to the ARP request; and - means for using said second node of the ARP reply forwarding opcode field indicates the type of ARP reply message the ARP reply forwarding code from said third node to said first network node member. 13.如权利要求12所述的设备，其中所述第二节点包括多个节点。 13. The apparatus of claim 12, wherein said second node comprises a plurality of nodes. 14.如权利要求12所述的设备，还包括用于在所述第一网络节点、所述第二节点和所述第三节点中存储检测到的先前ARP请求和ARP转发的未决列表的部件。 14. The apparatus of claim 12, further comprising means for said first network node, the second node pending list previous ARP requests and ARP forwarding said third node and stored in the detected component. 15.如权利要求14所述的设备，还包括用于对所存储的先前ARP请求或转发在所述未决列表中的存储时间设定时间限制的部件。 15. The apparatus according to claim 14, further comprising means for the stored previous ARP requests or forwards the storage time in the pending list of the set time limit. 16.如权利要求12所述的设备，还包括用于设定允许节点发送到特定目的地的ARP转发的速率限制的部件。 16. The apparatus of claim 12, further comprising setting means for allowing the node to send to a particular destination of the ARP forwarding rate limiting. 17.如权利要求12所述的设备，还包括用于在ARP消息过程期间测量节点之间的链路质量并将链路质量信息分发到节点的部件。 17. The apparatus of claim 12, further comprising means for measuring between nodes during ARP message during link quality and link quality information is distributed to the member nodes. 18.如权利要求17所述的设备，其中所述链路质量信息至少包括确认信息、无线电链路质量、数据率吞吐量及误码率之一。 18. The apparatus according to claim 17, wherein said link quality information comprises at least one of acknowledgment information, radio link quality, error rate and the throughput data rate. 19.如权利要求17或18所述的设备，还包括用于使用所述链路质量信息确定何时应更新ARP表的部件。 19. The apparatus of claim 17 or claim 18, further comprising means for using the link quality information to determine when to update the ARP table member. 20.如权利要求17或18所述的设备，还包括用于将所述链路质量信息与阈值进行比较以便确定是否要进行更新的部件。 20. The apparatus of claim 17 or claim 18, further comprising means for the link quality information with a threshold value to determine whether or not to update the member. 21.如权利要求12所述的设备，还包括用于在一个节点无法与某个节点进行通信时， 生成ARP错误消息并分发到所述网络中的侦听节点的部件。 21. The apparatus as claimed in claim 12, further comprising means for when a node can not communicate with a certain node, ARP error message is generated and distributed to listening nodes in the member network. 22.如权利要求12所述的设备，还包括用于所述第二节点在转播或转发所述ARP请求前修改所述ARP请求的部件。 22. The apparatus of claim 12, further comprising means for modifying the second node before the broadcast ARP request or the ARP request forwarded. PCT/SE2004/000537 WO2005099222A1 (en) 2004-04-05 2004-04-05 Method, communication device and system for address resolution mapping in a wireless multihop ad hoc network.